This is an herbal supplement that provides dual action menopause support. It relieves hot flashes, night sweats, nervousness, mood swings, sleeplessness and vaginal dryness. It also supports sexual function. Hops (Humulus lupulus) cone extract: Contains plant estrogens, which bind to primary estrogen receptors and help the body adjust to lower estrogen levels during menopause. Maca (Lepidium meyenii) root extract: Maca balances hormone levels in menopausal women and also contains vitamins and minerals that are required for healthy functioning of heart, bones and mind. Black cohosh (Cimicifuga racemosa) root extract: Contains phytoestrogens and is a commonly used ingredient to curb symptoms of menopause. It is prescribed as an alternative to hormone therapy in patients with hormonal imbalance. Women can take 1 capsule twice a day. Price for a 60 capsule bottle is $29.99. There is no discount offered on this. This price is comparatively steeper than other commonly available menopause supplements. Dual Action Menopause Response does not come with any money-back or refund guarantee. The company does not accept returns of used products. However, this supplement is manufactured using Good Manufacturing Practices listed by the FDA and so must adhere to the basic quality standards. This does not guarantee product effectiveness. 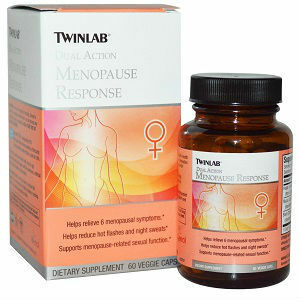 Is Dual Action Menopause Response By Twinlab Worth It? Maca and hops are less commonly used but have been found to be effective in controlling the symptoms of menopause. The ingredients are standardized to deliver fixed quantities of the active component to provide consistent benefits. Dual Action Menopause Response has only three active ingredients and does not separately deal with the different requirements of the body during day and night. Jackie Horowitz	reviewed Twinlab	on October 18th	 and gave it a rating of 2.